Welcome to the Home Page of the Office of the Dickinson County Sheriff. Dickinson County is located on the Wisconsin-Michigan border in the central portion of the Upper Peninsula (U.P.) of Michigan, with the City of Iron Mountain being the County Seat. Dickinson County is the youngest of the 83 Michigan Counties. The Dickinson County Sheriff's Office serves the 27,472 citizens, including the many tourists and visitors of the county. It comprises some 775.5 square miles. The Road Patrol Lieutenant supervises the uniformed Road Patrol Deputies and oversee the Civil Process portion of the office. The Road Patrol investigates all crimes outside of the corporate city limits of Iron Mountain, Kingsford and Norway. 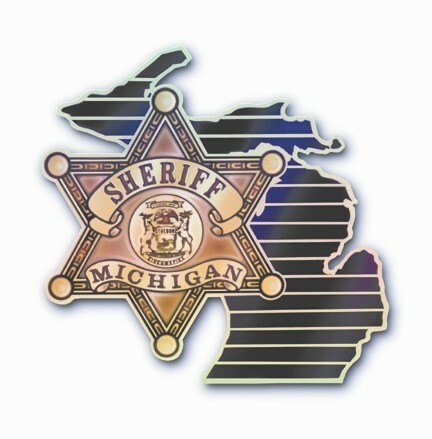 The office is also responsible for the enforcement of Michigan traffic laws and assists other agencies within the County. The patrol deputies are also deputized in the State of Wisconsin, through the Florence County Sheriff's Office, providing backup and assistance to them. The Sheriff's Detective Lieutenant is in charge of all criminal investigations and is one of the leaders of the KIND (Kingsford, Iron Mountain, Norway, Dickinson County) drug investigation unit. The Office is also the home for the E 911 (Enhanced) Dispatch Center. Currently the E 911 Center is run by the Sheriff's Office under the direction of the Sheriff and the Under Sheriff. The E 911 office is very unique in that it handles the dispatching and telephones for several other area departments. The office is capable of handling all radio and telephone traffic for the Florence County Wisconsin Sheriff's Office and all of its ambulances and fire departments, etc. The staffing of the E 911 office is augmented by a number of part time auxiliary officers. The Sheriff's Office is also in charge of enforcing the laws of the water. The office has a Marine Patrol Division that patrols the inland waters during the summer months. They are in charge of body recovery and they also train all young boat operators. The training is done mostly during the school years in cooperation with the area schools. During the winter months the Marine Patrol converts into the Snowmobile Patrol, where the Office patrols the many groomed and non groomed trails in the area, making it safe for fellow snowmobilers. In addition the Office has an ORV Patrol using four wheelers for patrolling the rural country roads and trails. All three of these are utilized in search and recovery and rescue of any unfortunate persons. Currently the Dickinson County Sheriff's Office is a member of the Critical Incident Response Team, which is used as a swat team in the event the situation calls for highly trained officers able to respond to unpredictable life threatening situations. This team is comprised of officers from the Sheriff's Office, Kingsford Public Safety Department, Iron Mountain and Norway Police Departments. The Dickinson County Sheriff's Office trained its first DARE officer in the fall of 1998. Currently the Sheriff's Office educates all sixth graders on the dangers of drugs and alcohol use through the teaching of the DARE program and in 2005 an enhanced program was added for 8th grade students. DARE teachings bring classes to all Dickinson Area Public/Private schools. In September of 1999 the Sheriff's Office began a Trauncy Program with the Court and School Systems. This program targets the parent rather than the child regarding truancy problems in the schools. Since the program was initiated, truancy in Dickinson County has dropped dramatically. K.I.N.D. is a multi-agency drug team. This team is responsible for all drug enforcement activity in the county. The K.I.N.D. team is comprised of officers from the Sheriff's Office, Kingsford Public Safety Department, Iron Mountain and Norway Police Departments. The Dickinson County Sheriff's Office is responsible for all court security in Circuit, District and Probate Courts, with one Deputy patrolling the area. Courthouse Bailiffs are provided through the Sheriff's Office for all three (3) courtrooms. The Dickinson County Sheriff's Office currently has one (1) part time uniformed Animal Control Deputy that provides Animal Control for 3 cities and 7 townships. Complaints range from animal bite cases, cruelty/neglect cases and all other type complaints. The Dickinson County Sheriff's Office is also the jail of the county. In the spring of 1997 the jail was remodeled and expanded to house additional prisoners. The jail has a total bed capacity of 71 beds/inmates, housing both male and female inmates. Under the Corrections Division, the Office also has a Sheriff's Work Van program. The program provides free community service to local non-profit and governmental agencies. People are assigned to this program via the District Court in lieu of jail time. It is offered to Misdemeanor crimes only and only to non security risk violators. This program provides valuable community service and frees up valuable jail bed space for the more serious offenders. Other programs at the Correctional Center are Alcoholics Anonymous, Narcotics Anonymous, Gideons, Community Schools, chaplaincy program, and mental health counseling.